Are You Relevant or Irrelevant to The Times? Are you important in your groups-family, church, workplace; can you stay on the subject of religion without fudging; are you connected to God; are you related to the Church; can people apply the name "Catholic" to you? closely connected or appropriate to the matter at hand. If people cannot identify you with being a Catholic, you have made yourself irrelevant to the world. The world needs Catholics more than ever at this time. The martyrs were relevant, appropriate for their time, to the point, germane. Are you germane, in the real sense of the word, of being related, having the same parents, being related? Are you related to God and His People? Are you building Catholic community? The man lived in dumpsters. At first, I thought the noises he made were those made by a raccoon scrounging for food. I talked to a native in the area, found out it was a man, and started to leave hot food, a duvet, a throw, and warm clothes by the dumpster. These things disappeared. I made hot bean soup, and Polish sausages, garlic bread, and other warm things. No city is civilized which lets a man live in dumpsters. No people are civilized, which do not care for those who cannot take care of themselves. I shall never forget the man I never saw--the man in the dumpster in Calgary. He reminds me of my sins. He reminds me that we live in mental and spiritual dumpsters of gross consumerism and greed. He reminds me that we have failed in our civilization and in our Christianity. I shall never forget him. Are You Committed to Truth? One of the huge problem of some Catholics is the ignoring of the signs of the times. I do not mean signs of the Apocalypse. I am not into End-Times except in my fiction, which is fiction. But, I am, and have been since the 1970s, sensitive to the growing real time of trial and persecution of the Church. I would like to ask my readers these questions. Are you seeing the patterns and paradigms which are pointing to a destruction of civil rights for religious persons? Are you seeing the possibilities of more than one major schism in the Church? Are you clear about your own position to a possible time of pain and suffering for the universal Church? Are you confronting your own sin and imperfections so that you will survive horrible persecution and, in addition , help others? Are you training your children to be committed to Truth? Are you willing to accept persecution in exchange for saving your immortal soul? Are you willing to stand up in the public square and acclaim your faith? Are you willing to be so committed to Truth, that you would die for the Church and Christ? Are you committed to Truth, Who Is a Person? Will you take time to read the perfection series on this blog? By the way, if you are not committed to truth, you are allying yourself with lies,and the Father of Lies. on his Church his Spirit poured! Alleluia! fire, that love may burn in all. Alleluia! grant us, dearest Lord, we pray. Alleluia! till our earthly wanderings cease. Alleluia! Of course, you know his name means "happy". For homeschooling parents who follow the Oxford Term, his feast day marks the beginning of Hilary Term, on or about January 13th. This saint is also the patron of children with learning disabilities. He himself was classically educated, which warms my heart. Here is more from this great French Doctor. This is a long passage, but I did not want to break it up. 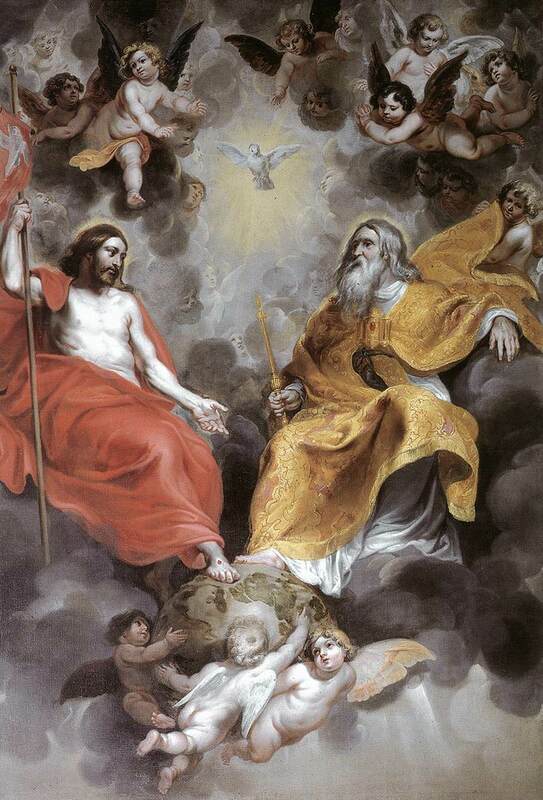 Again, it is from the saint's book on the Trinity. My comments are in blue. You hear the words, I and the Father are one649. Why do you rend and tear the Son away from the Father? They are a unity: an absolute Existence having all things in perfect communion with that absolute Existence, from Whom He is. When you hear the Son saying, I and the Father are one, adjust your view of facts to the Persons; accept the statement which Begetter and Begotten make concerning Themselves. Believe that They are One, even as They are also Begetter and Begotten. Why deny the common nature? Why impugn the true Divinity? You hear again, The Father in Me, and I in the Father650. Of course, Hilary is writing to the Arians, but also to us who are seeking perfection. Why? We must come to the realization of the Indwelling of the Trinity in us, through baptism and confirmation, so that we do not squander our lives in foolishness, seeking either fame, fortune or false loves. The only thing that matters is to desire and try to be saints, and saints are made, though suffering and grace. As the Trinity is one, so to we shall be one in God. This is our call, this is our goal. Hilary is, like Augustine and the others, not speaking from mere reflection or meditation, but from experience. He knew the Trinity from his conversion, from his walk with God, in his intellect, will, soul. As there is a perfect fullness of Christ in the Trinity, so as creatures, we are called to a perfection as much as we were created to be, to have, in Christ and in the Father, through the Spirit. As Christ is one, so we have our source in God and we, hopefully, go back to God at the end of our lives. That this is true of Father and of Son is demonstrated by the Son’s works. Our science cannot envelope body in body, or pour one into another, as water into wine; but we confess that in Both is equivalence of power and fulness of the Godhead. For the Son has received all things from the Father; He is the Likeness of God, the Image of His substance. The words, Image of His substance651, discriminate between Christ and Him from Whom He is, but only to establish Their distinct existence, not to teach a difference of nature; and the meaning of Father in Son and Son in Father is that there is the perfect fulness of the Godhead in Both. The Father is not impaired by the Son’s existence, nor is the Son a mutilated fragment of the Father. An image implies its original; likeness is a relative term. Now nothing can be like God unless it have its source in Him; a perfect likeness can be reflected only from that which it represents; an accurate resemblance forbids the assumption of any element of difference. Disturb not this likeness; make no separation where truth shews no variance, for He Who said, Let us make man after our image and likeness652, by those words Our likeness revealed the existence of Beings, Each like the Other. Touch not handle not, pervert not. Hold fast the Names which teach the truth, hold fast the Son’s declaration of Himself. I would not have you flatter the Son with praises of your own invention; it is well with you if you be satisfied with the written word. The image is our soul and its faculties and the likeness is grace, states St. Bernard. We have lost the likeness, through sin, and regain it in and through Christ and His Church, through the sacramental life of the Church. 24. Again, we must not repose so blind a confidence in human intellect as to imagine that we have complete knowledge of the objects of our thought, or that the ultimate problem is solved as soon as we have formed a symmetrical and consistent theory. Finite minds cannot conceive the Infinite; a being dependent for its existence upon another cannot attain to perfect knowledge either of its Creator or of itself, for its consciousness of self is coloured by its circumstances, and bounds are set which its perception cannot pass. We come to perfect knowledge of God through grace. This is a free gift from God, and when the CCC refers to 'divine life" in us, the authors mean grace. That we are totally dependent on grace to become perfect is a sure thing. We can chose to cooperate or not. Its activity is not self-caused, but due to the Creator, and a being dependent on a Creator653 has perfect possession of none of its faculties, since its origin lies outside itself. Hence by an inexorable law it is folly for that being to say that it has perfect knowledge of any matter; its powers have limits which it cannot modify, and only while it is under the delusion that its petty bounds are coterminous with infinity can it make the empty boast of possessing wisdom. For of wisdom it is incapable, its knowledge being limited to the range of its perception, and sharing the impotence of its dependent existence. And therefore this masquerade654 of a finite nature boasting that it possesses the wisdom which springs only from infinite knowledge earns the scorn and ridicule of the Apostle, who calls its wisdom folly. He says, For Christ sent me not to baptize, but to preach the Gospel, not in the language of wisdom, lest the cross of Christ should be made void. For the word of the cross is foolishness to them that are perishing, but unto them that are being saved it is the power of God. For it is written, I will destroy the wisdom of the wise and the understanding of the prudent I will reject. Where is the wise? Where is the scribe? Where is the enquirer of this world? Hath not God made foolish the wisdom of this world? For seeing that in the wisdom of God the world through its wisdom knew not God, God decreed through the foolishness of preaching to save them that believe. For the Jews ask for signs and the Greeks seek after wisdom, but we preach Christ crucified, unto Jews indeed a stumbling-block and to Gentiles foolishness, but unto them that are called, both Jews and Greeks, Christ the power of God and the wisdom of God. Because the weakness of God is stronger than men, and the foolishness of God is wiser than men655. Thus all unbelief is foolishness, for it takes such wisdom as its own finite perception can attain, and, measuring infinity by that petty scale, concludes that what it cannot understand must be impossible. Unbelief is the result of incapacity engaged in argument. Men are sure that an event never happened, because they have made up their minds that it could not happen. This means that all have the capacity to come to God and become one with Him. God does the work in us, if we but desire and cooperate. The works we do are useless unless we are at the stage where God is doing the work through us. Look at the last two lines above. Unbelief stops the process of growing in holiness. The mind narrows and becomes concerned about useless things. Priorities change. Some people give up, stating that holiness is not possible or too hard. I have heard people say that Catholicism is too hard. That is Hilary's point here. It is hard, but not impossible. If we create a blockage in our own minds that we can never achieve holiness, perfection, then we shall not to do. their narrow horizon, the other wisdom, which alone is Divine and perfect, seemed foolishness to them. Thus their foolishness actually consisted, in that feeble imagination which they mistook for wisdom. Hence it is that the very things which to them that perish are foolishness are the power of God to them that are saved; for these last never use their own inadequate faculties as a measure, but attribute to the Divine activities the omnipotence of heaven. Sadly, so many atheists hold this position today, as do many Protestants. They accept what is...rather than what can be. God rejects the wisdom of the wise and the understanding of the prudent in this sense, that just because they recognise their own foolishness, salvation is granted to them that believe. Unbelievers pronounce the verdict of foolishness on everything that lies beyond their ken, while believers leave to the power and majesty of God the choice of the mysteries wherein salvation is bestowed. There is no foolishness in the things of God; the foolishness lies in that human wisdom which demands of God, as the condition of belief, signs and wisdom. How many people make bargains with God? Bargaining is NOT part of the road to perfection. We cannot say, "God, if you do this, I shall do that." We cannot ask for consolations. On the contrary, many of God's closest friends did not have consolations. Hilary was married and had a daughter, His wife and daughter both died. He lived like a lay brother, as a secular monk. He did not have consolations. If we get stuck in seeking consolations instead of absorbing suffering gladly, we shall not reach perfection and we shall not see God. This is why the Cross is so important to both St. Paul and St. Hilary They know from experience that suffering brings goodness, purity, direction, enlightenment. It is the foolishness of the Jews to demand signs; they have a certain knowledge of the Name of God through long acquaintance with the Law, but the offence of the cross repels them. The foolishness of the Greeks is to demand wisdom; with Gentile folly and the philosophy of men they seek the reason why God was lifted up on the cross. And because, in consideration for the weakness of our mental powers, these things have been hidden in a mystery, this foolishness of Jews and Greeks turns to unbelief; for they denounce, as unworthy of reasonable credence, truths which their mind is inherently incapable of comprehending. But, because the world’s wisdom was so foolish,—for previously through God’s wisdom it knew not God, that is, the splendour of the universe, and the wonderful order which He planned for His handiwork, taught it no reverence for its Creator—God was pleased through the preaching of foolishness to save them that believe, that is, through the faith of the cross to make everlasting life the lot of mortals; that so the self-confidence of human wisdom might be put to shame, and salvation found where men had thought that foolishness dwelt. I love this passage. It is our weaknesses, our "crosses" which bring us to perfection. But, we must crave, desire, with our whole hearts, and minds and souls the splendour which is a Person, Who is God. Not the law saves us, although once we are in Christ the law becomes easy. It is Christ Who saves us. For Christ, Who is foolishness to Gentiles, and offence to Jews, is the Power of God and the Wisdom of God; because what seems weak and foolish to human apprehension in the things of God transcends in true wisdom and might the thoughts and the powers of earth. 26. And therefore the action of God must not be canvassed by human faculties; the Creator must not be judged by those who are the work of His hands. We must clothe ourselves in foolishness that we may gain wisdom; not in the foolishness of hazardous conclusions, but in the foolishness of a modest sense of our own infirmity, that so the evidence of God’s power may teach us truths to which the arguments of earthly philosophy cannot attain. Hilary is also talking to the New Age proponents-the real holders of earthly philosophy. For when we are fully conscious of our own foolishness, and have felt the helplessness and destitution of our reason, then through the counsels of Divine Wisdom we shall be initiated into the wisdom of God; setting no bounds to boundless majesty and power, nor tying the Lord of nature down to nature’s laws; sure that for us the one true faith concerning God is that of which He is at once the Author and the Witness. Do not set boundaries to the graces that God wants to give to you. Do not limit Him or yourself in Him. If you limit His grace, you will not gain heaven, because the mediocre become evil so quickly. One gets the energy for action from prayer. My comments in blue on a section from St. Hilary of Poitiers on The Trinity: Book Three, found here. ....let us see what this glory is which the Son expects to receive from the Father; and then our exposition will be complete. The sequel is, I have glorified Thee on the earth, having accomplished the work which Thou hast given Me to do. And now, O Father, glorify Thou Me with Thine own Self with the glory which I had with Thee before the world was. I have manifested Thy name unto men. It is, then, by the Son’s works that the Father is glorified, in that He is recognised as God, as Father of God the Only-begotten, Who for our salvation willed that His Son should be born as man, even of a virgin; that Son Whose whole life, consummated in the Passion, was consistent with the humiliation of the virgin birth. How can we fear any humiliation? Humility is recognizing that Christ became Incarnate and died for me. He left His Glory to become Man. Thus, because the Son of God, all-perfect and born from everlasting in the fulness of the Godhead, had now by incarnation become Man and was ready for His death, He prays that He may be glorified with God, even as He was glorifying His Father on the earth; for at that moment the powers of God were being glorified in the flesh before the eyes of a world that knew Him not. But what is this glory with the Father, for which He looks? And, because He has taken on our humanity, then we can share in His Perfection. It is that, of course, which He had with Him before the world was. He had the fulness of the Godhead; He has it still, for He is God’s Son. But He Who was the Son of God had become the Son of man also, for The Word was made flesh. He had not lost His former being, but He had become what He was not before; He had not abdicated His own position, yet He had taken ours; He prays that the nature which He had assumed may be promoted to the glory which He had never renounced. Therefore, since the Son is the Word, and the Word was made flesh, and the Word was God, and was in the beginning with God, and the Word was Son before the foundation of the world; this Son, now incarnate, prayed that flesh might be to the Father what the Son had been. He prayed that flesh, born in time, might receive the splendour of the everlasting glory, that the corruption of the flesh might be swallowed up, transformed into the power of God and the purity of the Spirit. It is His prayer to God, the Son’s confession of the Father, the entreaty of that flesh wherein all shall see Him on the Judgment-day, pierced and bearing the marks of the cross; of that flesh wherein His glory was foreshown upon the Mount, wherein He ascended to heaven and is set down at the right hand of God, wherein Paul saw Him, and Stephen paid Him worship. This splendour, which we shall only see when in Heaven, in the Beatific Vision, is given to us partially if we are willing to be perfected, emptying ourselves as Christ emptied Himself. He did not run from pain or even death, so how can we run from what is really hard in the call to perfection, to be like Christ, to be Christ in this world? Today, is the feast of St. Hilary, and the beginning of Hilary Term in England. But, he has been This is from theCatholic Encyclopaedia on line. I love his defence of orthodoxy. Bishop, born in that city at the beginning of the fourth century; died there 1 November, according to the most accredited opinion, or according to the Roman Breviary, on 13 January, 368. Belonging to a noble and very probably pagan family, he was instructed in all the branches of profane learning, but, having also taken up the study of Holy Scripture and finding there the truth which he sought so ardently, he renounced idolatry and was baptized. Thenceforth his wide learning and his zeal for the Faith attracted such attention that he was chosen about 350 to govern the body of the faithful which the city had possessed since the third century. We know nothing of the bishops who governed this society in the beginning. Hilary is the first concerning whom we have authentic information, and this is due to the important part he played in opposing heresy. The Church was then greatly disturbed by internal discords, the authority of the popes not being so powerful in practice as either to prevent or to stop them. Arianism had made frightful ravages in various regions and threatened to invade Gaul, where it already had numerous partisans more or less secretly affiliated with it. 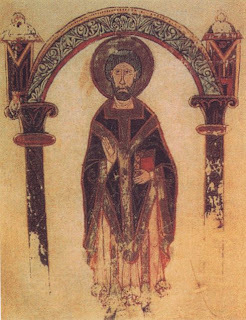 Saturninus, Bishop of Arles, the most active of the latter, being exposed by Hilary, convened and presided over a council at Béziers in 356 with the intention of justifying himself, or rather of establishing his false doctrine. Here the Bishop of Poitiers courageously presented himself to defend orthodoxy, but the council, composed for the most part of Arians, refused to hear him, and being shortly afterwards denounced to the Emperor Constantius, the protector of Arianism, he was at his command transported to the distant coasts of Phrygia. But persecution could not subdue the valiant champion. Instead of remaining inactive during his exile he gave himself up to study, completed certain of his works which he had begun, and wrote his treatise on the synods. In this work he analysed the professions of faith uttered by the Oriental bishops in the Councils of Ancyra, Antioch, and Sirmium, and while condemning them, since they were in substance Arian, he sought to show that sometimes the difference between the doctrines of certain hereticsand orthodox beliefs was rather in the words than in the ideas, which led to his counselling the bishops of the West to be reserved in their condemnation. He was sharply reproached for his indulgence by certain ardent Catholics, the leader of whom was Lucifer, Bishop of Cagliari. However, in 359, the city of Seleucia witnessed the assembly in synod of a large number ofOriental bishops, nearly all of whom were either Anomoeans or Semi-Arians. Hilary, whom everyone wished to see and hear, so great was his reputation for learning and virtue, was invited to be present at this assembly. The governor of the province even furnished him with post horses for the journey. In presence of the Greek fathers he set forth the doctrines of the Gallic bishops, and easily proved that, contrary to the opinion current in the East, these latter were not Sabellians. Then he took part in theviolent discussions which took place between the Semi-Arians, who inclined toward reconciliation with the Catholics, and theAnomoeans, who formed as it were the extreme left of Arianism. After the council, which had no result beyond the wider separation of these brothers in enmity, he left for Constantinople, the stronghold of heresy, to continue his battle against error. But while the Semi-Arians, who were less numerous and less powerful, besought him to become the intermediary in a reconciliation between themselves and the bishops of the West, the Anomoeans, who had the immense advantage of being upheld by the emperor, besought the latter to send back to his own country this Gallicbishop, who, they said, sowed discord and troubled the Orient. Constantius acceded to their desire, and the exile was thus enabled to set out on his journey home. In 361 Hilary re-entered Poitiers in triumph and resumed possession of his see. He was welcomed with the liveliest joy by his flock and his brothers in the episcopate, and was visited by Martin, his former disciple and subsequently Bishop of Tours. The success he had achieved in his combat against error was rendered more brilliant shortly afterwards by the deposition of Saturninus, the Arian Bishop of Arles by whom he had been persecuted. However, as in Italy thememory still rankled of the efforts he had made to bring about a reconciliation between the nearly converted Semi-Arians and the Catholics, he went in 364 to the Bishop of Vercelli to endeavour to overcome the intolerance of the partisans of the BishopLucifer mentioned above. Almost immediately afterwards, that it might be seen that, if he was full of indulgence for those whom gentleness might finally win from error, he was intractable towards those who were obstinate in their adherence to it, he went toMilan, there to assail openly Auxentius, the bishop of that city, who was a firm defender of the Arian doctrines. But the EmperorValentinian, who protected the heretic, ordered Hilary to depart immediately from Milan. Again, I have been talking with Catholics who simply do not believe in objective truth. They cannot understand the concept of truth outside of themselves. They are complete relativists and subjectivists. The idea that God revealed truth to us, moral and other types of reality, in the form of natural law, the Ten Commandments and the teachings of the Catholic Church is, simply, not believed. One cannot be a Catholic without accepting objectivity-that there is a reality outside ourselves and that God is the center of our world, not us. The stubbornness of those who refuse to even think about the reality of objectivity make it hard to discuss issues in rational discourse. Without discussion it is hard to bring some truth into situations of confusion. To instruct the ignorant is one of the spiritual works of mercy, but some must be open to being instructed. Christ Himself did tell us to walk away from those who over and over and over again want to hear truth. This is a hard saying, but Christ said this. I think when we have worked with someone for a long time, trying to bring them to Christ, and they refuse to see the light or want to see it, merely arguing or defending a atheist position, all we can do is back off and pray. Do not be afraid to trust someone to God and move on. Sometimes, we just have to trust that God will reveal Himself to those who do not want to hear God's Word. I imagine many, many people were praying for Paul. Heat a frying pan over medium-high heat until hot then add 1 tablespoon of oil. Add the octopus and fry undisturbed until it’s browned on one side. Flip the octopus over and brown on the second side. Transfer the octopus to a plate then add the remaining tablespoon of oil. Add the celery, onions and garlic and fry until translucent and just starting to brown around the edges. The caramelization will add a lot of flavor to our sauce but they’ll still be firm enough that they’ll add texture to the dish. Add the octopus back in with the tomatoes, bell pepper, paprika, bay leaf, salt and pepper, then let the mixture come to a boil while stirring it all together. Turn down the heat to medium-low, partially cover with a lid, and simmer for 15 minutes. Add the potatoes and stir to combine. Partially cover and simmer for about 30 minutes, stirring periodically, until the potatoes and octopus are tender and the sauce is nice and thick.